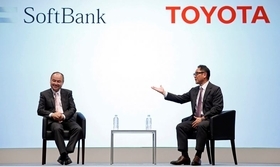 SoftBank's Masayoshi Son shared the stage with Toyota President Akio Toyoda last year in a rare joint appearance by two of Japan's top captains of industry. SoftBank Group Corp. leader Masayoshi Son has much bigger ambitions for transportation than simply seeing his investment in Uber Technologies Inc. turn into more than $13 billion when the ride-hailing company goes public next month. The Japanese entrepreneur is placing a $60 billion bet in more than 40 companies in a bid to steer the $3 trillion global automotive industry now dominated by vehicles people own and drive to a spectrum of transportation services available at the touch of a smartphone app. Those services range from ride hailing and car sharing to delivery robots and self-driving vehicles. Manbang, a Chinese logistics group that merged with Huochebang (Full Truck Alliance). Investment: $1 billion. Nuro, a U.S. maker of automated delivery robots. Investment: $940 million. Auto1 Group, a German online auto retailer. Investment: $560 million. Cambridge Mobile Telematics, a U.S. provider of data analytics. Investment: $500 million. Zume Pizza, a U.S. developer of automated delivery vehicles. Investment: $375 million. Loggi, a Brazilian logistics firm. Investment: $111 million. Zhong An, a Chinese online insurance provider. Investment: $100 million. The extent of those investments, based on a Reuters analysis of publicly available data and interviews with a dozen sources familiar with SoftBank's investment strategy, has not previously been reported. They show how Son has emerged as one of the power players trying to influence how people and goods move about the world in the coming decades. Key partners in Son's quest are Uber, the U.S. ride services leader, and Japan's Toyota Motor Corp.
Uber's planned initial public stock offering in May is expected to value the company at $90 billion to $100 billion, representing a potential windfall to SoftBank, which put $8 billion into Uber for a 15 percent stake in January 2018. Son has been working since 2014 to weave together a tapestry of diverse transportation bets. His deep portfolio of investments range literally from A to Z: From Arm, a British semiconductor maker that Son acquired in 2016 for $32 billion, to Zume Pizza, a Silicon Valley startup that aims to automate pizza delivery and raised $375 million last year from SoftBank. The rising value of that investment will further supercharge Son’s growing clout in the sector, and eventually provide him with additional capital to invest in mobility. Closer to home, Toyota approached Son more than a year ago about a partnership, and SoftBank in February 2018 signed a memorandum of understanding with the automaker to consider how they might jointly develop mobility services, according to sources familiar with the document. The agreement was followed by the launch of a joint venture dubbed Monet Technologies, designed to set up automated mobility services. SoftBank and Toyota are also in talks to co-lead a $1 billion investment in Uber's self-driving unit, Reuters reported in March. While the deal is close to being finalized, discussions remain ongoing around issues such as how much of the unit SoftBank would control, sources told Reuters. Toyota declined to comment for this story. In an interview with Reuters, SoftBank Group COO Marcelo Claure said that the two Japanese companies "have a lot sessions in which we think and we try to redefine the future of mobility." Central to those sessions are discussions about how Toyota and SoftBank can collaborate to bring autonomous vehicles to Japan, he said. 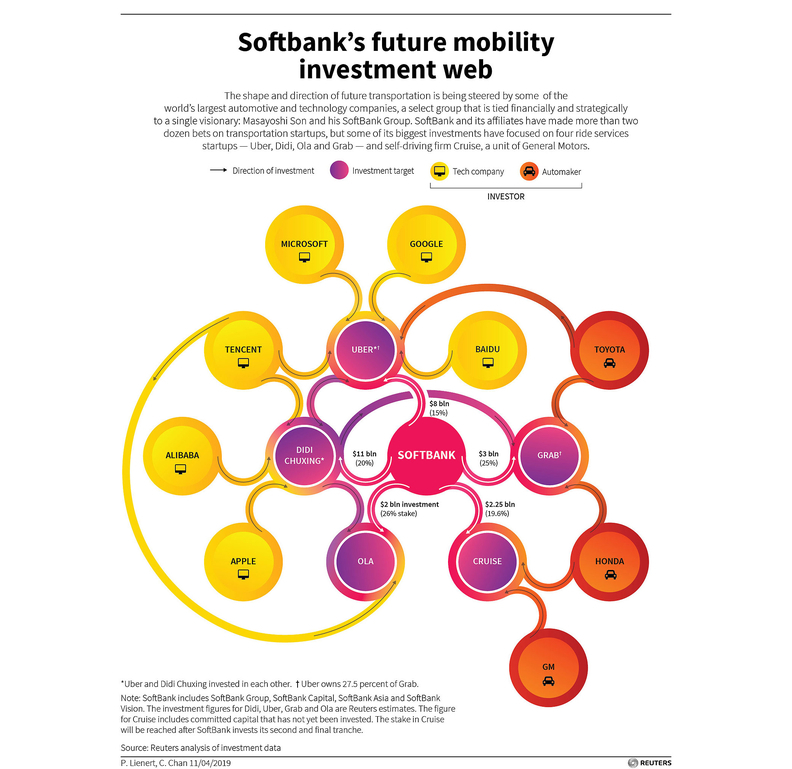 SoftBank has used at least five investment vehicles, including the $100 billion Vision Fund, from which to make its mobility investments, public records show. Its deep pockets, aggressive investing tactics and sweeping vision of the future of transportation give SoftBank and its leader Son an outsized influence in shaping the entire industry. The Vision Fund has more than 30 investment professionals who work to promote cooperation and integration among the portfolio companies, which they refer to as a "family." "We can create this web where companies talk to each other and they help each other because they are part of the same family and they do joint ventures and they do joint investments," Claure said. SoftBank and its affiliates have focused some of their biggest investments on self-driving firm Cruise, a unit of GM, and four global ride-services giants — Uber, Didi Chuxing, Ola and Grab. SoftBank is the largest shareholder in the four ride-services companies and the largest outside shareholder in Cruise. Son "is the true emperor of future mobility," said Tom De Vleesschauwer, senior director of long-term planning and sustainability at IHS Automotive. SoftBank Managing Partner Michael Ronen sits in the front seat of a driverless Cruise AV in May 2018 along with then-GM President Dan Ammann, left, and CEO Mary Barra. Ammann now is CEO of Cruise. To help implement his vision, Son also allied with General Motors Co. and Honda Motor Co., each of which is investing heavily in self-driving vehicles and ride services. Son laid out his future of transportation vision in an October press conference alongside Toyota, where he talked about building a "cluster" of leading mobility companies in different sectors, which "can collaborate with each other." Toyota a year ago introduced e-Palette, an electric shuttle designed for self-driving ride and delivery services, and quickly signed up Uber and Didi as development partners. The e-Palette is also the centerpiece of Monet Technologies, which added Honda as a minority partner in March. All are tied back to SoftBank. That collaboration is expected to enable some SoftBank companies to become "superapps," or applications where customers go for a range of services, such as transportation, shopping and payments. Such companies can be much more lucrative than those that offer just one core business or service. 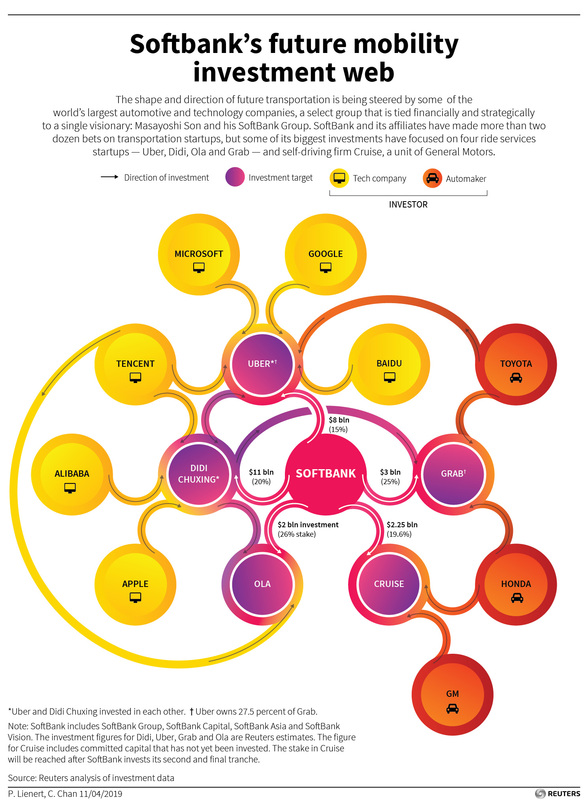 But the fact that many of SoftBank's companies are rivals can complicate the investor's ambitions. Uber and Ola, the Indian ride-hailing company, remain fierce competitors and are never in the same room when SoftBank discusses ride-hailing strategies, Claure said. Traditionally in venture capital, funds do not invest in direct competitors. "There are tremendous synergies, but on the other hand there is significant risk of tremendous conflicts of interest," said Paul Asel, managing partner at NGP Capital and a longtime mobility investor. There are limits to the investor's influence, however. For example, SoftBank encouraged Cruise to acquire or take a stake in self-driving startup Nuro, but talks between the companies never led to a deal, according to two sources with knowledge of the matter. So SoftBank made its own, $940 million investment in Nuro. In his five-year transportation push, Son's stakes in ride services startups now look like bargains. In late 2014, SoftBank joined Alibaba, China's internet giant in which SoftBank also has a stake, in a $600 million funding round in Kuaidi Dache, the forerunner of China's Didi. That investment has grown to more than $11 billion in Didi, in which SoftBank now holds more than 20 percent. SoftBank's partnerships with major automakers are also proving to be a boon to transportation startups. Toyota invested in Uber in 2016, then boosted its stake seven months after SoftBank's investment. Honda followed SoftBank with an investment into Grab, and last year committed $2.75 billion to Cruise's self-driving project, aiding SoftBank's ambitions. But the SoftBank portfolio is not without risks, particularly for companies dependent on the Japanese firm to sustain them financially for years to come. SoftBank faces financial pressures, including an obligation to pay an annual 7 percent dividend on a portion of the invested capital and has burnt through the majority of the Vision Fund. And it is compelled by a new U.S. law cracking down on foreign investment in technology to submit many of its mobility investments to a government regulatory agency for approval. Should that regulatory group block a deal, it could be catastrophic to a startup. But there is some safety for Son given the size of his portfolio. "He's shooting for big game," Roger Lanctot, global automotive practice director at Strategy Analytics, said of Son. "He only needs to bag one or two and he will do just fine."